SD61 and Westcoast Adventure College have teamed up again this year to offer TALE, Tourism And Leadership Exploration. Gain knowledge in wilderness, first aid, navigation, leadership and communication skills while enjoying the outdoors. Students will earn 4 credits for coursework and 4 credits for work experience. Applications can be picked up in the Career Centre and are due into Mrs. Giesbrecht by end of day April 26th. SD61 and Pacific Design Academy are offering Summer Graphic Design Program again this summer. This is an 8 week program including a foundation of graphic design knowledge, connection to local industry, advance soft skills and work experience. Students will earn 4 credits for skills and development and 4 credits for work experience. Application can be pick up in the Career Centre and are due into Mrs. Giesbrecht by end of day April 26th. Achieve Anything Foundation and the Canadian Coastguard have joined forces to show women marine jobs. Hands-on activities will include elements from Coast Guard Search & Rescue, Canadian Hydrographic Service, Marine Communications & Traffic Services, Electronics, Marine Engineering, Science and a tour of CCGS Tanu. Please Note: Bring your own lunch/snacks! There is a fridge & microwave available for your use. The student job that kick-starts careers. We offer opportunities for Grade 11 and 12 youth to be paid members of our Youth Get ItInterns. They work as community ambassadors and as Member Service Representatives helping our members in our branches. Applications close on Wednesday, April 11, 2018. Talk to instructors and program experts, about the subjects you’re interested in and get the answers you need to make the decision that’s right for you. There will be campus tours throughout the evening and snacks will be available. Applications are submitted during the Grade 11 school year, enabling students to plan how they will fit courses at UVic into their Grade 12 studies. Review the program guide to see if uStart is the right fit for you and your educational goals. You’ll need to think about your future post-secondary plans, what class you’d like to study at UVic and if you’ll have room with your high school timetable and busy schedule. If you’re thinking about applying, you should speak with your high school counsellor or principal as early as possible about your interest in the program. Together you can decide if participation is a good option for you. Your high school counsellor or principal can help you prepare your application package. Your uStart tuition will be paid by SD61. However, you are responsible for paying student fees and other costs related to your studies, such as textbooks and lab supplies. May - decisions are sent by email. End of June - Official admission letters are mailed to uStart participants. Fall / winter - Participants attend classes at UVic ​. 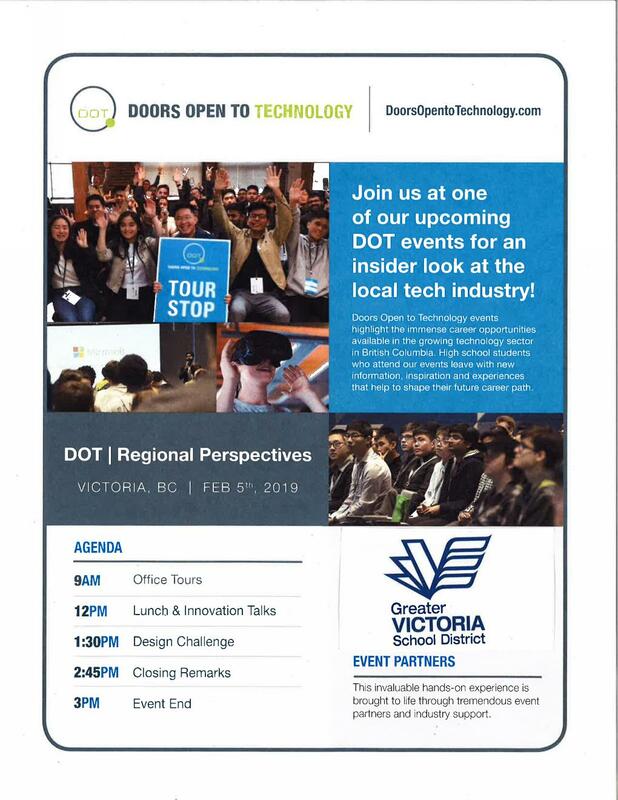 ​DOT - Doors Open to Technology - This one day event will highlight the career opportu-nities available in the growing technology sector. 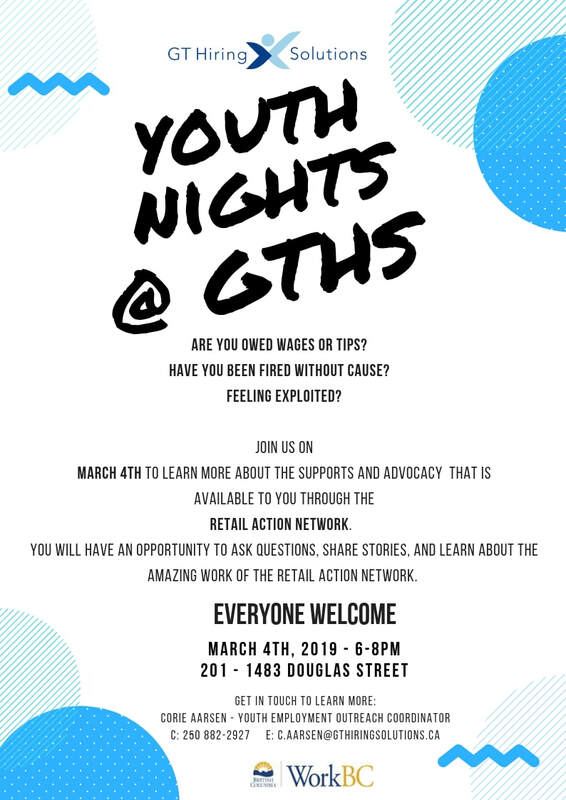 Students from grade 9-12 who attend the event will leave with new information, inspiration and experiences that help to shape their future career paths. It is on February 5th from 9:00am to 3:00pm and applications are due in to Mrs. Giesbrecht by January 29th. Interested students can pick up an application in the Career Centre. 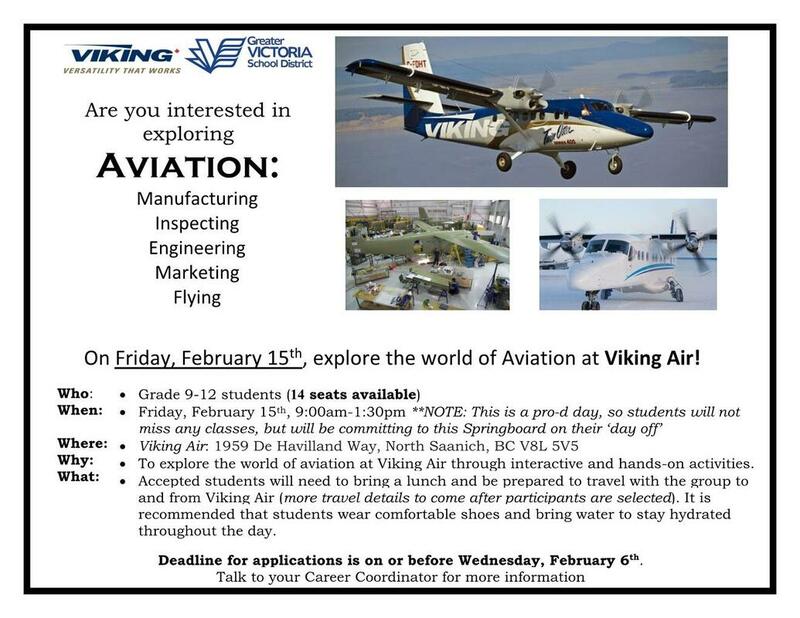 ​Aviation Springboard 2019 - Viking Air and the Greater Victoria School District are hav-ing an exploration day on Friday, February 15th (pro d day) from 9:00am-1:30pm. Stu-dents will explore the world of aviation at Viking Air through interactive and hands-on activities. Interested students who would like to apply or have questions are asked to see Mrs. Giesbrecht in the Career Centre. Please hand your completed application form in by February 6th to Mrs. Giesbrecht. 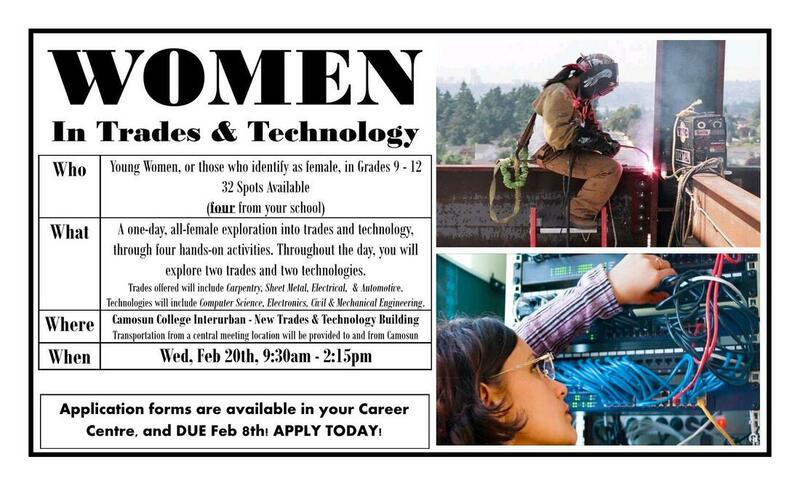 Oak Bay can send four girls (grades 9 - 12) to take part in a trades and technology day at Camosun College Interurban Campus on Wednesday February 20th from 9:30am to 2:15pm. The attached poster includes all the details. If you are interested please pick up an application from Mrs. Giesbrecht in the Career Centre. All applications are due in to Mrs. Giesbrecht by February 8th.